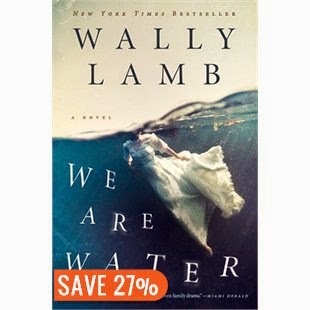 This month's book club selection was We are Water by Wally Lamb. I usually do my book club post on the same day as book club but I hadn't finished the book in time. I did finish it in the morning though. I have a read some of Wally Lamb's books before. They always have a tragic element and this one is no exception. They are similar to Ann Marie MacDonald's books too, which are some of my favourite reads. The stories are hard to read - abuse, loss, injustice, neglect, etc. - but I can never seem to put down the books. This was really well written and told the story from different characters' perspectives. I always like that style of writing because when a chapter is over, a new voice is there ready to keep telling the story but from a new viewpoint. It's a change of pace and a break from one character so I just want to keep reading. I mentioned its difficult storylines. There are a few chapters written specifically about a child molester and I had to skip over them. It is one thing when that is part of the story and it is hinted at and we can fill in the blanks ourselves, but this was written out very specifically about what happened to this guy and then how he started abusing kids himself, I didn't want to read about it like that. I know bad things happen but I still want to protect myself from knowing them all. Reading about the abuse is also way more difficult now that I'm a mother. In all of the cases of abuse in this book, the parent of the abused child didn't know what was happening. It's so scary to think that someone can harm your child and then convince them to keep it a secret. It is one of those things that I can't think about, so I'll just stop. One thing I don't like is when the author tries to connect the title of the book to the whole story but does it in the last couple of pages. This also happened in a book we read last year, The Goldfinch. It's like the author is writing an essay for their English Literature class at the end where they explicitly connect themes and imagery from throughout the book and then basically say, "and that's why I called the book "We are Water" (in this case)". I actually don't think it is useful for anyone. For those of us who appreciate English essays, I feel like it's a little condescending. I get it, I don't need you to spell it out for me. And for those people who didn't get it, I'm not sure they're actually interested in the connections anyway. If you've read other Wally Lamb books, or you like Ann Marie MacDonald, then read this one too. If you prefer to read books without breaking your heart, then maybe skip this one. You mentioned the role of secret keeping as it relates to abuse. This reminded me of something I read recently about secrets vs surprises. Basically the author encourages parents to teach children that in "our" family we have surprises not secrets. Secrets imply that no one ever learns the truth, whereas surprises indicate that eventually someone finds out. The idea is that if a child is then ever put in a situation (i.e. with an abuser/potential abuser) that they are asked to keep a secret, they are (hopefully) more likely to tell the abuser that they don't keep secrets in their family and are more likely to tell a parent/trusted adult that they have been asked to keep a secret. It's just a thought and maybe it goes too far in not allowing our kids to participate in the fun that "good secrets" hold. Maybe it's an idea that can be tailored to the situation - "we don't keep secrets about x,y,z". Having said that I suppose anything that might be considered a "fun secret" is likely to really be a surprise. Maybe it goes too far ...or maybe it's just one more tool we can use in an attempt to keep our kids safe in this sometimes mixed up world in which we live.